After months of planning and preparation, the 9th annual Enriching the Middle East’s Economic Future conference in Doha, Qatar has officially come to a close. The three-day conference was held jointly with the Doha Forum from May 12-14, 2014 and focused on finding solutions to key economic challenges currently facing the Middle East through international collaboration and entrepreneurship. 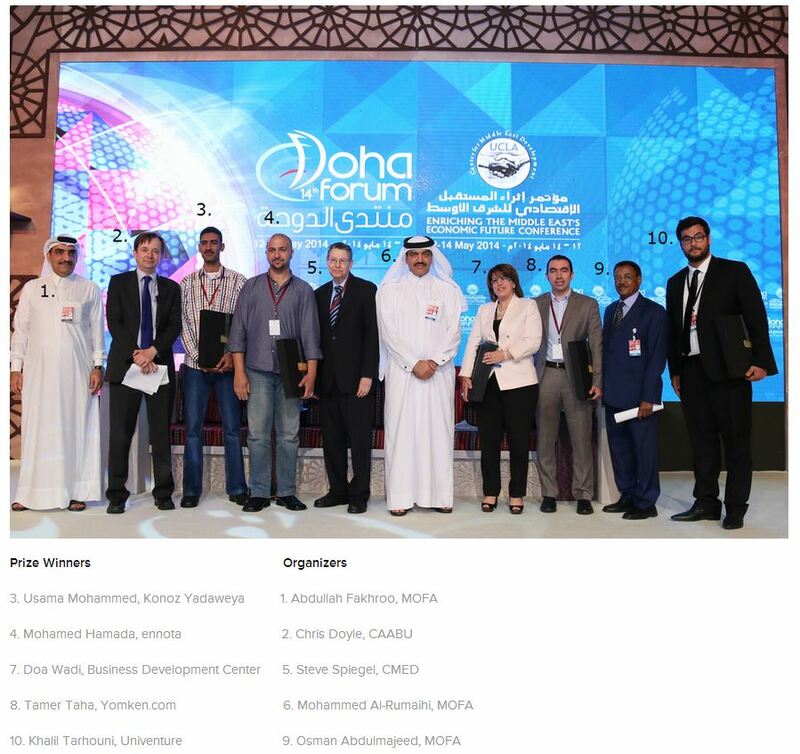 This year, CMED, the Doha Forum, and the Middle East Investment Initiative (MEII) took a new approach to address challenges facing entrepreneurship in the MENA region by hosting the first Doha Prize for Economic Innovation. The prize was awarded to distinguished entrepreneurs or projects that (1) stimulated the business environment for small and medium sized enterprises (SMEs); (2) improved education and training to increase skills and employability; and/or (3) promoted public sector innovation and growth in the MENA region. The Doha Prize for Economic Innovation is one of the few competitions in the Middle East that promotes social entrepreneurship and offers a six-month mentorship program. It is hopefully the first of many to come. Out of almost fifty applications from across the region, a group of twelve finalists were chosen to present their ideas and projects to a group of seven judges. All twelve finalists showed outstanding commitment to addressing key social and economic problems within the MENA region, but five stood out for their depth of impact and the long-term sustainability of their projects. The 5th place prize of $10,000 was awarded to Yomken.com, a non-profit platform based in Cairo, Egypt that seeks to address the challenges of grassroots innovation by using a hybrid model of open-innovation and crowd-funding platforms. Yomken aims to connect entrepreneurs working in low-tech and informal manufacturing industries with skilled and innovative university students. Yomken enables entrepreneurs to develop their ideas into products with the alternative finance method of crowd-funding. Tamer Taha, the founder and CEO of yomken.com stated that “crowdfunding has an advantage over [foreign] aid because it’s transparent.” By engaging young students, researchers, and potential entrepreneurs in the product production and finance processes, this often untapped pool of innovators can enjoy significant benefits when the product reaches the marketplace. The 4th place prize of $15,000 was awarded to Konoz Yadaweya from Qena, Egypt. Konoz Yadaweya is the first online fair trade marketplace for discovering Egyptian heritage and marketing local Egyptian handicrafts. Usama Mohammed, the founder and CEO of Konoz Yadweya, recognizes the “problems in taxation and regulations [where] there is no policy or specific brand for social entrepreneurship.” They intends to address these problems by operating as a middle man between the market place and local artisans. Konoz Yadaweya supports the sale and marketing of unique, ethnic, and traditional handicrafts because these products are often used as a sustainable means of livelihood for a large proportion of the labor force in Egypt, especially in poor rural and urban areas. The 3rd place prize of $20,000 was awarded to ennota, a technology start-up in Cairo, Egypt. ennota is a cloud-based financial management tool for small MENA businesses. ennota helps to better manage, plan, and monitor company finances by providing cash-flow management, accounting, and resource planning tools to small and family owned businesses. During a panel at the conference, Mohamed Hamada, the CEO of ennota, stated that if business owners do not have the numbers or data to think about profits margin, they cannot grow or illustrate ideas for growth, reducing their chances of getting access to finance. By providing these tools and services to boost financial literacy, ennota hopes to create a successful environment in the region for the growth of small businesses. The 2nd place prize of $25,000 was awarded to the Business Development Center for Women (BDC) in Palestine. This non-profit organization seeks to strengthen the role of businesswomen as leaders in the Palestinian economy through advocacy, networking, and the provision of business services. The BDC established an integrated business development services center to support the national goal of building human capital focusing on women's development. Doa Wadi, the Executive Director, asserts that the BDC was created to “bridge the gap” that women face by addressing problems including the lack of access to finance and business knowledge. The BDC enables Palestinian women-owned SMEs to integrate into export value chains and contribute to the sustainable economic growth of the country. Such integration will increase the employment rate and empower women to become active players not only within the economy but also within social and political communities. And finally, the first place prize of $30,000 was awarded to Univenture from Tunisia. This project develops scientific research from Tunisian universities into innovative business products. Khalil Tarhouni, the Project Manager of Univenture, stressed the importance of the meaningful collaboration between NGOs, government firms, and the private sector in the pursuit of social entrepreneurship. Each of these sectors has something to offer each other. The purpose of the Univenture program is to bring together these sectors by stimulating innovation and entrepreneurship by utilizing science and research from universities to produce innovative business projects. The program provides technical support and experiential learning to beneficiaries while identifying and selecting innovative ideas to be transformed into entrepreneurial business projects to further enhance the economic development of the region. These winners will receive a 6-month mentorship with regional and international experts to strengthen and support their projects while continuing to promote economic development. We hope that this program will encourage increased support for social entrepreneurship and economic innovation in the region. We look forward to sharing updates on their progress and impact on the MENA region!